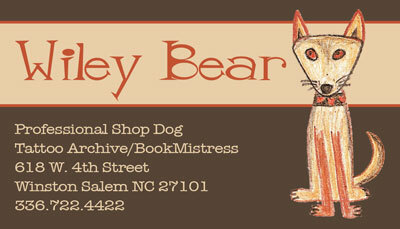 Wiley Bear was in and around the tattoo scene from 2005 through 2014. He made the move from Oakland, California to Winston Salem, North Carolina with the BookMistress in 2007. Just two years later he completed his Tattoo Shop Dog apprenticeship, earning the title "Professional Shop Dog" at the Tattoo Archive. He came to work at the shop everyday. 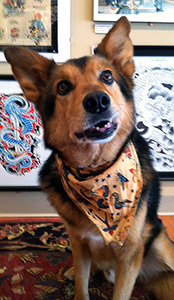 Besides greeting customers, Wiley also specialized in naps, cookie eating, and modeling all of the latest Tattoo Archive bandana designs. On May 31, 2014 Wiley was recruited as Professional Shop Dog for the Big Tattoo Shop in the Sky. The requirements were that he have at least 5 years experience, be familiar with tattoo history (given that there were a lot of historical figures working there), and not bring drugs or drama to the position. He got the job and we wish him all the best in his next chapter. We miss him terribly!